Get ready for summer with this showstopping stripe detail maxi dress. It's the perfect for staple for any wardrobe this summer and with holidays approaching this is sure to be at the top of your suitcase! 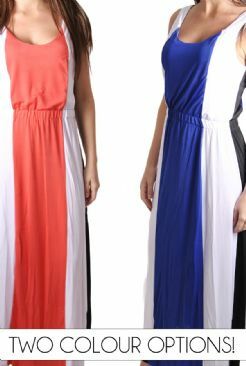 - It features a multi colour stripe design with an elasticated waist to give you that perfect hourglass figure. Pair with your favourite sandals and sunglasses for an instantly stylish look. - Available in sizes S/M (8-10) M/L (12-14)). Available in classic corals and regal blues, the only decision you will have to make is.. what colour do I get?! Not Sure Which Size Are You? View Our Size Guide!